Before starting the tutorial, lets collect all the required icons. The icons used in the demo is from Austin Andrews (@templarian). You can find it here. I have created an sprite image with the set of required icons, so that the loading time is reduced. 1. 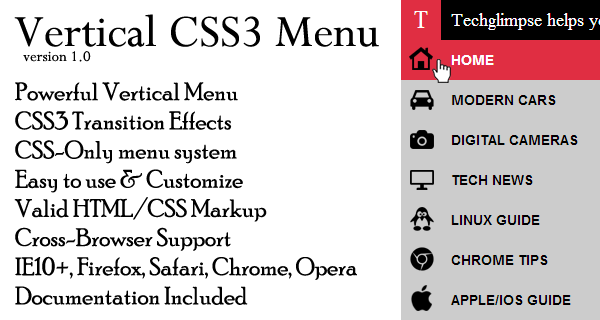 On hover of vertical bar of menu icons, extend the width to 200px. 2. Have the menu title hidden and on hover while extending the width, make it visible too. Make all the above transitions smooth using CSS3 transitions. You just have to play in the below CSS code for your specific requirements. You are free to download the menu and tweak as much as you want. The complete menu would be visible only if the viewport height is more than 810px. That means the menu is not responsive. I would suggest to limit the menu items and create a separate menu for mobile devices. We also provide a lot of other web-design techniques which includes CSS, CSS3 transitions, CSS3 Animations, CSS3 transforms, HTML5, Jquery etc., Our goal is to create a massive library of web design techniques, tutorials so that, web developers can have at their disposal. Check out all our demos! Want anything specific? Leave a comment below!